As a cornerstone of the State’s efforts to assist storm-impacted New Yorkers, the Governor’s Office of Storm Recovery (GOSR) operates the NY Rising Housing Recovery Program (the Program) to facilitate home repairs, rehabilitation, mitigation, and elevation for the owners of rental properties. The Rental Properties component of the Program provides funds for the repair of storm-damaged rental properties of all types and sizes, including single-family homes, townhouses, and apartment buildings. Above all else, GOSR has recognized the extreme importance of getting families back in their homes, while simultaneously ensuring compliance with U.S. Department of Housing & Urban Development (HUD) requirements. In compliance with the Uniform Relocation Act (URA), the Program offers relocation assistance to tenants permanently or temporarily displaced by the impact of Superstorm Sandy. Further information on URA for tenants and landords can be found on the fact sheets linked here. Information on other Housing Recovery programs, including the Single Family Housing, Condominiums & Co-Operatives, and Buyout & Acquisition programs, can be found here. February 2017 - The NY Rising Housing Recovery Program has established comprehensive program deadlines for Single Family Housing applicants. 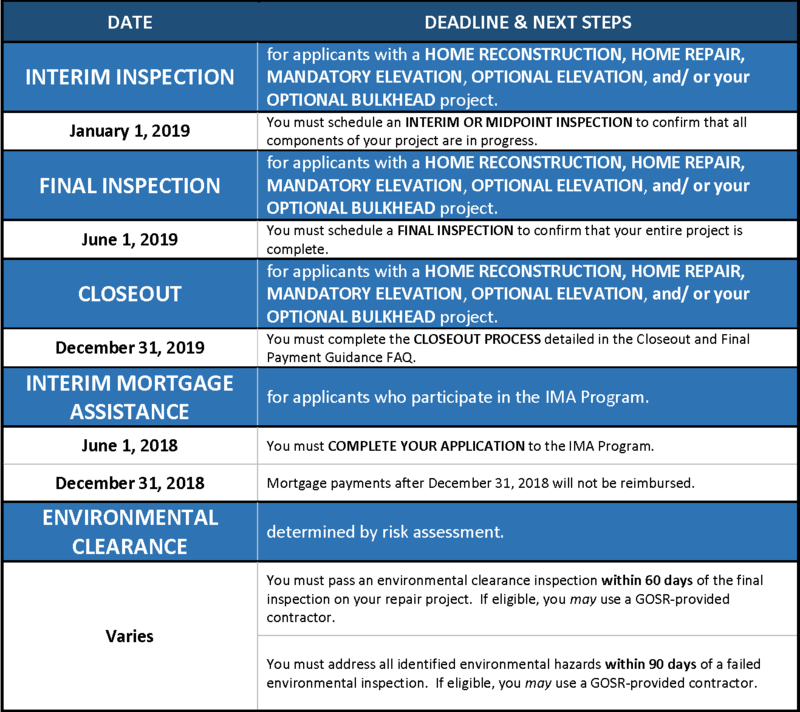 The Program sent active applicants with incomplete projects the NOTICE OF DEADLINES FOR YOUR FUNDING AND COMPLETION OF YOUR CONSTRUCTION PROJECT which details program deadlines and resources available to finish incomplete projects within a year’s time. If you are an active program applicant, please review the notice sent to you or refer to it linked above. July 2016 - The Rental Properties Program has closed the opportunity for applicants to opt-in for all Optional Items (Bulkhead, Elevation, and Optional Mitigation). November 2016 - Applicants must finish all Optional Mitigation work prior to final site visit. February 2016 - The Rental Properties Program has closed and is no longer available to new applicants. What Rental Properties are eligible? All storm damaged rental properties which are leased on a year-round basis and are located in one of the eligible counties. Seasonal rentals, non-primary residences, and second homes are not eligible. I live in one unit of my three-family town house, and rent out the other units to tenants on a year round basis. Is this an eligible Rental Property? I own a unit in a condominium or co-op which I rent out to tenant on a permanent year round basis. Is this an eligible Rental Property? Yes. However, if your condominium or cooperative is also applying for benefits pertaining to damage to the common elements of the property, you may also be asked to complete a brief “eligibility” or “CM” application. No, this program does not provide direct benefits to tenants. However, if you are a tenant in a building was damaged by the storm, you can advise your landlord about the program. My primary residence is in a co-op, in which I own shares, and which I have a proprietary lease allowing me to occupy the unit. Should I apply under the Rental Property program? No. Please apply under the Co-op/Condo program.